Bekah and I love hymns; in terms of worship, they are the language of our hearts. Whenever we have the opportunity to sing them during a church service it is a blessing to us. This morning our hearts were blessed as we sang various familiar hymns during a sunrise service at Nueva Esperanza (New Hope) Baptist Church, but singing well known hymns in another language opens up an interesting door for reflection. As anyone can tell you, translation is not an exact science, especially in poetry and music. At times there is a large distance between what we sing in Spanish and what we remember singing in English. 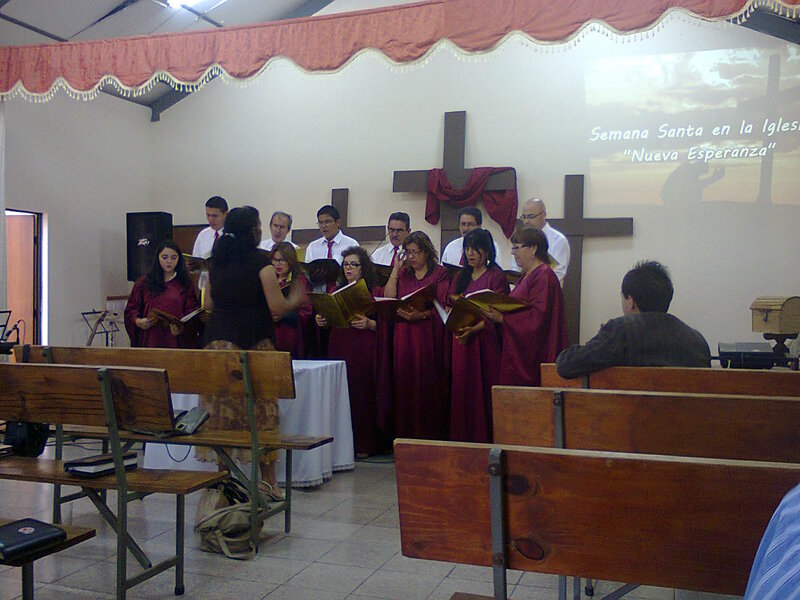 During the service, the choir sang a few special hymns for the congregation. Sometimes we feel like the Spanish translation doesn’t do justice to the beauty of what we’ve always known (maybe when we’re suffering culture shock!). Other times we feel the meaning is altered ever so slightly by the translation, for better or for worse. This morning, there was a line in one hymn that struck me because of this very fact; the meaning was changed and when seen side by side in both languages, I feel that it gives us an even deeper understanding of our lives in Christ. The hymn was “Because He Lives,” and the line that caught my eye was this one: “Because he lives, I can face tomorrow.” In Spanish the translation is, “Porque él vive, triunfaré mañana” (Because he lives, I will triumph [over] tomorrow). As we sang I continually thought of the different understandings that these two translations offer. On the one hand, the English version takes seriously that tomorrow may bring sorrow, sadness, and strife. We may be in pain, we may lose things or people dear to us, and we may even suffer the way in which Jesus did, the way he said we are to imitate. Even so, says the hymn, I can face the challenges as they come because Jesus is alive. It doesn’t promise us an easy life, but just the ability to face whatever may come because Jesus lives. On the other hand, the Spanish tells us that in whatever tomorrow brings we will be triumphant. It doesn’t tell us that all will be magnificent; that our lives will be easy, but it does remind us that, because Jesus is alive, because he triumphed over the grave, we can know that we too will triumph over death. So no matter what comes our way, we will be victorious, and we can claim that victory, because Jesus lives. As I think about these two understandings perhaps they have something to offer each other. In other words, perhaps the English-speaking church and the Spanish-speaking church can learn something from one another just by sharing these interpretations. Maybe we in the English-speaking church need to be reminded that we are and will be triumphant. Too often, perhaps, we focus on merely being able to face what comes our way that we forget that Jesus not only promises us the ability to survive, but to thrive, to be victorious. And maybe the Spanish-speaking church needs to remember that while we will be triumphant, at times it may not feel that way. Even so we can face whatever comes our way, regardless of how painful it is, regardless of how much it doesn’t feel like victory, because Jesus lives. This is becoming one of my new Easter hopes: that our North American and South American churches can begin to share the wealth of what we have as equals. I hope that we, the body of the resurrected Christ, will be mutually encouraged as we journey together. I pray that we can move past one church being the ‘sending’ church and the other the ‘receiving’ church, and, instead, bind ourselves together in a mutual embrace of love and respect as we learn from each other the richness of our faith and as we help each other along the way, and I, for one, am honored to be a part of that journey. Thanks for sharing! I’m going to read this in my Spanish II class tomorrow. Hope you guys are well! God bless! !